Today, designers use a variety of materials and their combinations, as well as technologies for building a fence. One of the strongest is stone. It will last a long time and will reliably protect property from unauthorized intrusions. 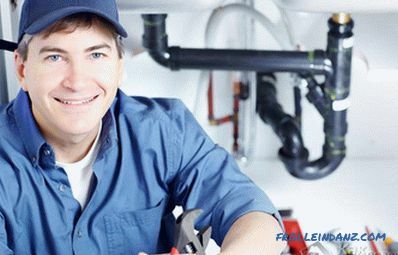 In most cases, the construction involved in professional builders. 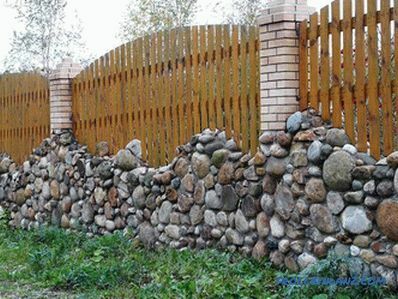 But if you have time, then you can build a stone fence with your own hands. To do this, take into account the advice of experts, as well as follow the step-by-step instructions provided in this article. The stone for the fence has been used for a long time. Even in ancient times, people used it to protect their homes. In modern construction and landscape design, natural materials are very popular. A large variety of natural and artificial stone can lead you to confusion. It is important to choose the right kind of stone, which will emphasize the intended style and direction. Cobblestone (boulder stone). A fairly common and affordable option. Despite its simplicity, it is one of the most durable stones. Basically, the cobblestone has a gray color that not everyone likes. But you can get a cobblestone of red-brown color. Gravel. Not less popular material. Thanks to the various factions, you can create a fence of any shape. Many combine large and small gravel. 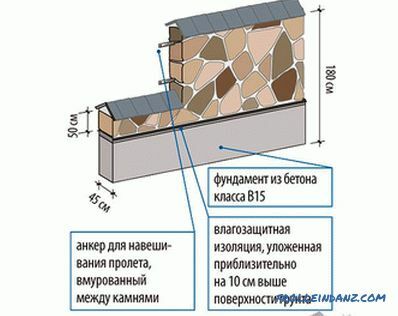 The latter option is suitable for filling the steel frame. 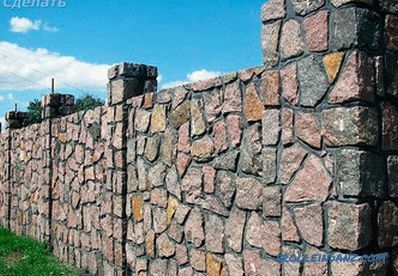 It is often combined with brick to make a solid fence. Dolomite stone. It has a flat shape, different sizes and thickness. It is mined in mountain quarries. 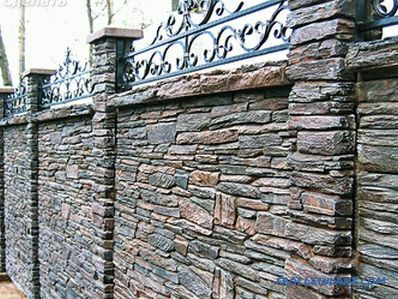 Due to the high quality, a fence made of natural stone will be not only attractive, but also durable. Limestone. This stone is divided into several types, namely - shell rock, marble-like, bryozoans. Due to its softness, limestone is very easy to process. That is why this option is chosen by many newcomers who decide to experiment with their fence. The only drawback is moisture absorption. 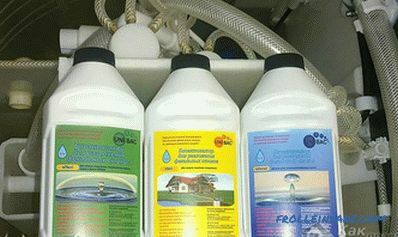 To prevent the destruction of limestone pre-treated with a water-repellent. Sandstone. For many years, sandstone has been used for erecting fences at sites. 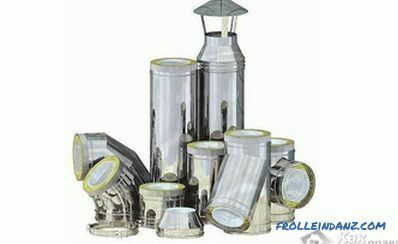 Among the advantages are high strength, frost resistance and moisture resistance. Booth. It is extracted from sandstones, limestones and dolomites. This stone has an irregular shape. The length of the rib can be from 15 to 50 cm. It can be used not only for construction, but also for facing the fence. 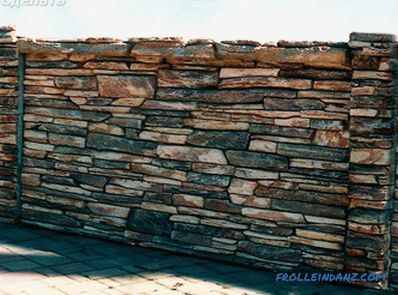 Not less popular lately is the option of a fence made of artificial stone. Its cost will be several times less than natural stone. In most cases, for its production using concrete, which is added pigments. The resulting products are difficult to distinguish from natural stone. Before making a choice, it is necessary to examine the state of the groundwater, the surroundings, and also take into account the atmospheric influence. the possibility of combining with different materials. to ensure the strength of the whole structure, a foundation will be required. 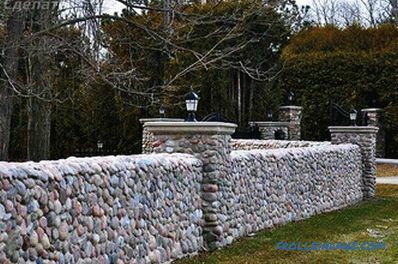 If you do the work of building a stone fence with your own hands, you can significantly reduce costs. 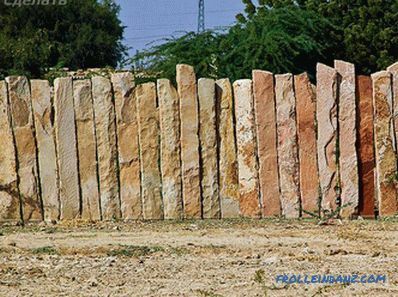 Wood and stone - this is an original combination, through which you can get a harmonious fence area. Quite a complex process that requires special attention, as well as special skills and preliminary development. Stone in the grid. 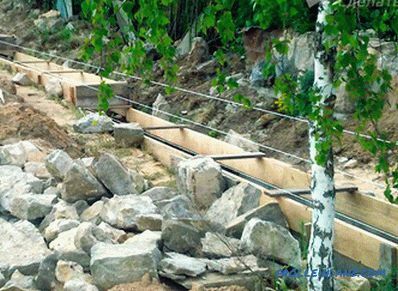 Among the latest designer know-how, gabions have become very popular (from French means "stones in grids").The basis for the fence will be a grid of thick metal wire, which is filled with gravel of small and medium fractions. In addition, you can use the remnants of building materials (brick, gravel, stone). The form of the fence can be any - it all depends on the intended design. As a result, you can get a fence of high strength. Stone and brick. The most common combination of materials. On the poured foundation of brick lay out pillars and several rows for the foundation. In the resulting spans between the pillars laid stone. This combination allows you to create a presentable fence. High strength, endurance, resistance to rapid temperature changes and precipitation makes it popular. 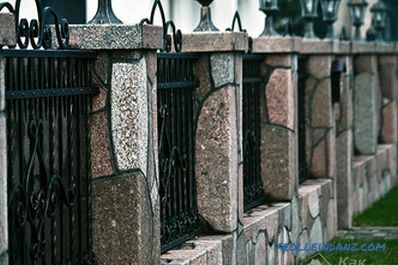 If you decide to make a fence out of gabions, then you can use live woven plants in addition. This solution looks very original. Filling of strip footing. 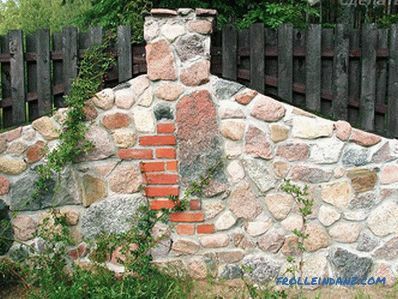 It should be noted that it can be performed in two main ways: concrete, rubble stone and mortar. Undoubtedly, technology with buta will be easier, but such a foundation will not be very reliable. Therefore, it is better to use concrete, which, thanks to a shutter speed of several months, will be durable. It is necessary to begin the following stage only after full drying of the basis. Waterproofing. Particular attention is paid to waterproofing the foundation, which is carried out in 2 stages. The first must be done before pouring concrete with roofing paper. They cover both walls and the bottom. The second stage is carried out after complete drying of the foundation. The same roofing material is laid on top of the prepared site. Due to waterproofing, water from the soil will not get into the structure and will not start to destroy it. Laying stone. The main process is laying of stone. The main and rather labor-intensive process is the selection of stones in size and shape. If necessary, you can cut the stones, but it will require a lot of time and effort. The technology itself depends entirely on the type of stone. 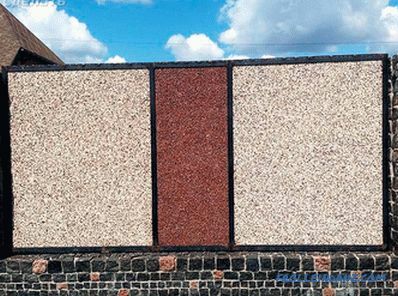 For example, brick technology can be used for sandstone and treated cobblestones. 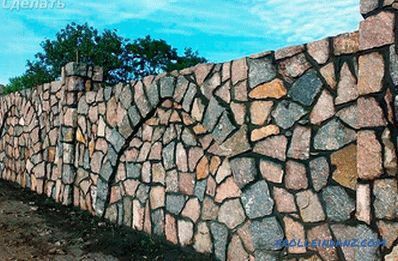 When choosing a rubble stone, it is worth considering the technology of installation of formwork. The first step is to bring the pillars, which should be wider than the spans. Seam processing. After the fence is fully erected, you can begin to seal all the seams. If you miss this important point, then the attractiveness of the fence will be lost. For too deep seams, it is necessary to use an additional solution. If the stones are very dirty, it is necessary to clean the excess with a brush on the metal. With some types of stones, it is necessary to remove the solution that has not yet cooled. Sometimes there is a need to change the look or design of the fence. Changing the landscape, the presence of flaws or a large number of irregularities. In this case, crushed granite, which can refresh the fence, is perfect. To perform the work it is necessary to apply a facade primer. 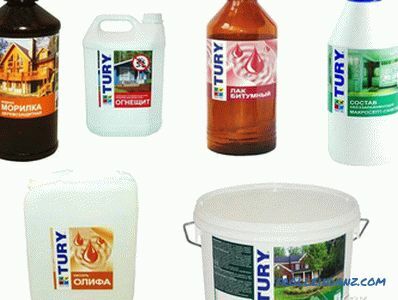 After it is completely dry, a special adhesive or cement mortar is used, in which a plasticizer is added. Chipped granite is tightly fixed on the prepared surface. Do not forget about the jointing, and in the end wipe the surface. 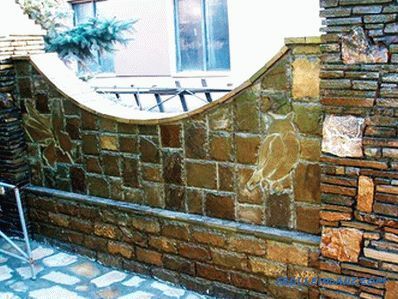 Various combinations of flat materials and structural plaster can be used to decorate a stone fence. 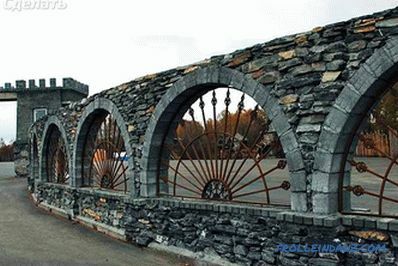 Building a fence of any kind of stone is a rather laborious process. But the result will please everyone. The enclosed work, time and expenses will pay off with a beautiful and original look, as well as a high-strength fence. It will serve the owners for many years without losing its attractiveness.